Originally selected by the New York Yankees and in their farm system the Yankees lost Tommy Kahnle in the Rule 5 Draft. Kahnle was brought back to New York at last year’s trade deadline. He has become a dominate reliever and his addition to an already fantastic bullpen has only improved an already superb lineup. Born in Latham, New York, Kahnle attended Shaker High School. Kahnle after High School went on to pitch for Lynn University in Boca Raton, Florida. The Yankees eventually went on to select Kahnle in the fifth round of the 2010 draft. Kahnle was promoted quickly through the Yankees’ system. He made it up to Triple A during the 2012 season. Kahnle had received an invite to spring training in 2013. He ultimately did not make the team and in the off-season the Rockies selected him in the Rule 5 draft. Kahnle made the Rockies Opening Day roster in 2014, as it is a requirement that any player selected in the Rule 5 Draft must be on the Opening Day roster. Kahnle made his debut on April 3rd. He a decent rookie season as he posted a 4.19 ERA in 59 games. In 2015, Kahnle played in both the majors and triple A. Following the season Kahnle was designated for assignment and traded to the White Sox. Opening day is right around the corner, so you’re not going to want to miss out on any BIG news! Sign up to our free newsletter to get premium Yankees content straight to your email. Kahnle had a nice season for the White Sox in 2016. Only appearing in 29 games, he posted a 2.63 ERA. In the first half of last season, Kahnle blossomed into a fantastic reliever. In 36 innings Kahnle had a 2.50 ERA and struck out 60 batters. The Yankees acquired Kahnle along with Todd Frazier and David Robertson for Blake Rutherford, Tyler Clippard, Ian Clarkin and Tito Polo. He was a spark for the Yankees as he was ejected for throwing at Miguel Cabrera which led to that classic brawl with the Tigers. 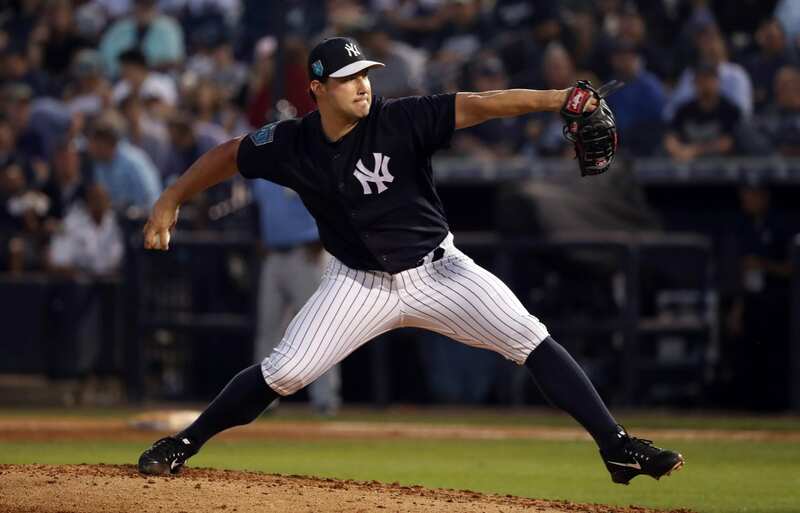 Kahnle was on the Yankees postseason roster for each round as he was dominate posting a 2.38 ERA in seven games. Kahnle has the stuff the be a closer, but for the 2018 Yankees he will be primarily used in the 6th and 7th innings. Khanle has a plus fastball that he can use to get many batters out with. Kahnle will play a substantial role in 2018 and has the potential to be a nominee for AL reliever of the year. Kahnle can truly become one of the most dominate relievers in MLB.